Does it now rest on the shoulders of the dead? When the living stop speaking up, the dead lead protests in Pakistan. Two days ago, the Hazaras laid to rest the 87 bodies of their loved ones, while some 25 still waited to be identified in mortuaries across hospitals in Quetta. The dead watched and waited, anticipating a change, some sanity and a semblance of justice, as did the Hazaras and the whole nation. For that, they were made to wait for four days, while their loved ones could not even grieve as they were meant to because they were too invested in the hope that this sacrifice would result in a safer future for the community. The Hazaras were laid to rest, as were some of their demands which the government dealt with deftly, diplomatically and well -politically. Two days later, some 5,000 tribesmen are protesting outside the governor house in Peshawer, against the killing of the 18 people whose mutilated bodies were recovered from the Bara area of Khyber Agency on January 15. What does this have in common with the Hazara protest? Peaceful but not inactive, they sit with the caskets housing the bullet-riddled bodies of their family members, chanting slogans and asking for the army to leave. According to the tribesmen of Bara, these were ordinary citizens, not militants, killed by security agencies before they even got a chance to advocate their innocence. What new levels of desperation are the people of this country reaching that no other form of protest seems to work anymore? What extreme measures does a family have to go to in order to get people to notice their plight? This, I assure you, is not done with ease. Family members of those whom we are calling “dead bodies” were changing the shrouds of those bleeding bodies of slain Hazaras sometimes more than once a day, carrying slabs of ice to avoid decomposition. Imagine having to live through that! Imagine a mother deciding that her son’s burial needs to wait. Imagine a son delaying giving a shoulder to his father’s funeral. Too emotional, these details – I agree. And why relive them in these already morbid times, we may think. Now that the almost-ex-Prime Minister has handed over the ‘lollipop’ to the Hazaras, the media attention is safely focused on theLong March. The Hazaras are old news and the tribesmen in Peshawar sitting-in with those caskets are peripheral small news – really. I mean, just look at what they are competing against. Tahirul Quadri’s blood-boiling use of rhetoric and promises, coupled with his interesting get-up. Peaceful protests hardly stand a chance when juxtaposed against the Long March that ironically threatens to destroy the very concept Quadri is repeatedly talking about – Jamhuriyat (democracy). The Pied Piper pipes away. The awaam follows in throngs. But let’s not blame the media only. The media gives you, pre-dominantly, what the awaam wants to read, see and hear. A crowd that is accusedly a million strong gets attention like nothing else does – attention of a nation that has extremely short attention spans and no concept of following up on a cause. The Hazara and Balochistan issue woke us up from our apathetic slumber for a bit. Once the dead were buried, we are focused on more glamorous issues. The Shahzeb Khan issue is yester news. The tribesmen are in Khyber Pakhtunkhwa (KP). We are desensitised to KP happenings in any case. We are an emotional lot. All we have for free in this country starved of food, clothing and shelter (along with power and gas) is emotions. The good side of this is that if and when we wake up to a legitimate cause, we can make real change and ruffle just the right feathers. But we lose that passion way too soon and get distracted way too easily. Sustained focus on causes challenges the status quo, else headlines come and go. The political circus of this country shall continue, and will continue to get its share of attention. However, it is up to the people and the media to keep alive other issues that matter – like health, education, food-security and safety for the people of this country. I pray that the Hazaras did not keep their loved ones waiting to reach their final destination in vain. I also pray that no one, again, has to reach that level of frantic desperation that the only way they can draw attention to their cause is the coffins of their dead. Too idealistic a hope, perhaps. Posted in Human Rights, Straight From The Heart and tagged Balochistan, Bara Si In, Hazara community, KP, Long March, Quetta, Quetta bomb blasts, Shia Genocide, Shia Hazaras, Tahirul Qadri. Bookmark the permalink. “Two killed, 19 injured in Peshawar attack,” read the headlines on a busy Monday morning in Pakistan. The attack, in the terror-hit province of Khyber-Pakhtunkhwa, came three days after a bomb ripped through a busy market, killing 11 people. A few months ago – when I was visiting the province – I met with the staff at the Lady Reading Hospital (LRH), which remains at the forefront of catering to victims of terror attacks that have been plaguing the region for the last six years. The list of victims is ever-growing, as is the endless task of their medical healers. “The situation had improved for a while, but it is back to being the same again,” said Yasar Yousafzai, who works as coordinator of the Vesicovaginal Fistula unit at LRH. Over 200 acts of violence, including bomb attacks, targeted shootings and improvised-explosive-device (IED) attacks, have been reported in the province and its adjoining Federally Administered Tribal Areas (Fata) up until August this year. Last year, 1,206 people died (511 civilians, 364 militants and 331 security personnel) in 242 incidents of violence, according to the South Asia Terrorism Portal (SATP), whosetimelines for both years present a gruesome picture. “Every second person from the tribal areas has lost a family member to militancy,” said Dr Nasreen Ruby Faiz, Head of the Department of Gynecology at the hospital. According to Dr Rahim Jan Afridi, a forthright man who was until recently serving as the Medical Superintendent at LRH, one bomb blast can result in hundreds of casualties, of which, most arrive here. Afridi himself hails from Khyber Agency in Fata. “Sadly, we are able to do very little for the injured in those areas, as we have our limitations as medical practitioners. 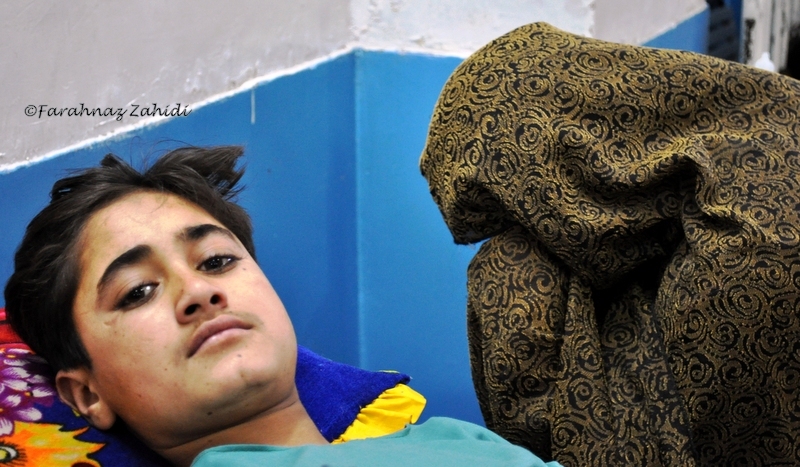 Most hospitals in the tribal areas have been shut down due to drone attacks and bomb blasts. We are unable to help them. Government servants in the tribal regions don’t venture due to threats of terrorism. Even I cannot even go to my hometown, even for a wedding or a funeral. I joke that I am an IDP (Internally Displaced Person),” said Afridi, frustrated at his helplessness. Dealing with thousands of casualties in a month or hundreds in a day can be traumatic. “It’s not just the medical staff. I believe the whole community of this area is psychologically affected. Over time, the medical staff has to develop psychological resilience. Our feelings are very real, but fear takes over the sadness. The fear of getting abducted. Every morning, at every signal, I fear for my safety,” confessed Afridi. When terror victims are brought to public hospitals, they not the only affect the people working on them, but also those who have spent hours and days awaiting the medical staff’s attention. “Obviously, the terrorism-victim patients are VIP patients for us. All their treatment is free of cost and they get our utmost attention,” said Afridi. Consequently, other patients slide down on the priority list. Investigating the plight of bomb-blast victims and hospital staff who treat them, I met with victims of the Parachinar suicide blast on February 17, 2012. The powerful explosion after Friday prayers ripped through Kurrmi bazaar and subsequent open-fire on protestors by security forces resulted in 43 deaths. Some of the injured were still being treated when I met them. Thirteen-year-old Abrar Hussain was lying helplessly on the bed, partially conscious under the effect of the pain killers he had been given, with blood being transfused. I couldn’t help stare at this innocent, handsome young man, who was unlucky enough to be in Kurrmi bazaar to buy a pair of chappals for his mother. A few beds down the huge hall that houses several bomb-blast victims who are lucky enough to have survived, was Qaiser Hussain, 14. A student of seventh grade with the sole aim of recovering in order to “go back to school.” His mother, Fatima Bibi, could not answer my questions despite the presence of a translator, simply because she could not stop crying. The family had lost two relatives in the same blast. The doctors told me that Qaiser was still serious, with severe abdominal and limb injuries. Many a night, I have wondered how Qaiser is. Has he gone back to school? Is he okay? How many Qaisers have been added to the list of casualties since my trip? 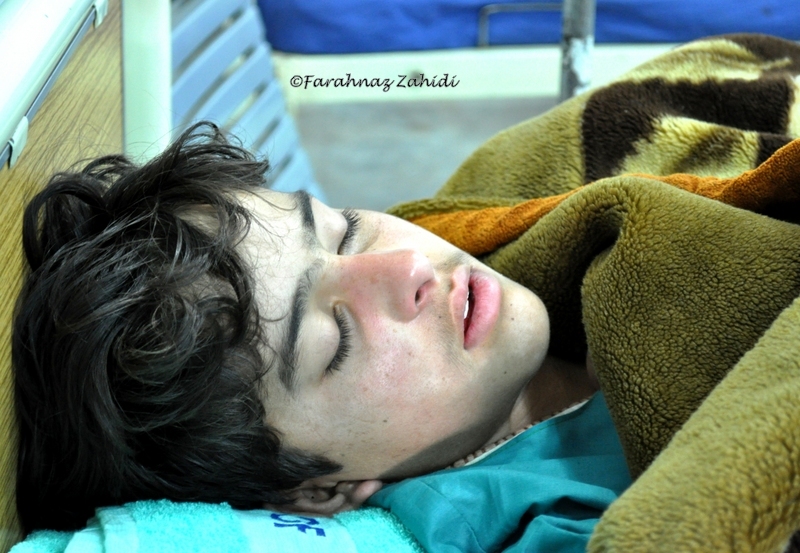 Qaiser Husain, 14 year old victim of a bomb blast in Parachinar, KP. The people of KP are stuck in an abyss. Will they ever come out of it? The author is a freelance writer, activist and blogger. Posted in Human Rights, Pakistan and tagged bomb blasts KP, bomb blasts Peshawer, KP, Lady Reading Hspital, Parachinar blasts, Peshawer. Bookmark the permalink.